Icelandic artists Legend and Sólstafir announced last week that, after selling out their limited-to-300 units 7" vinyl split of 'Fjara' / 'Runaway Train', they would be re-issuing the two cover tracks on the rarely-used cassingle format. The cassingle format was chosen as a way to release radio masters, which were commissioned to give the tracks a boost on the Icelandic national radio, RUV. The cassingle edition is limited to 100 copies, of which nearly 80 sold in the first 48 hours. 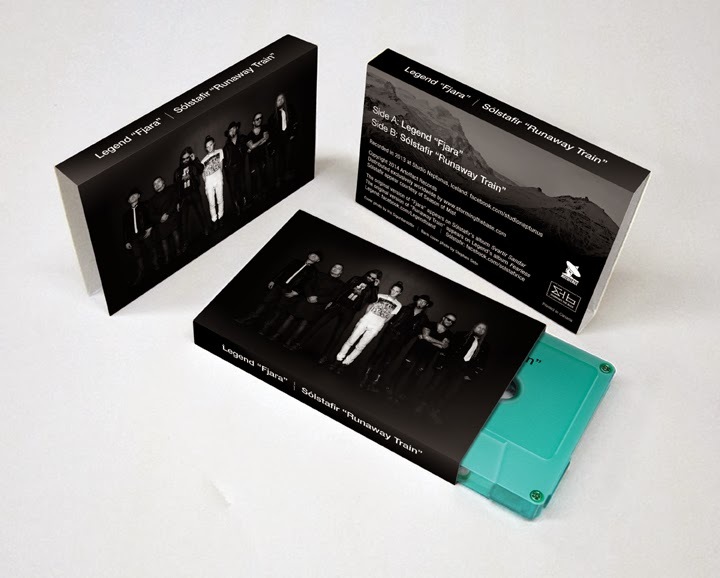 The cassingles come in six different collector colours, each colour chosen by a band-member. Each cassingle will also come with a download coupon. The bands also announced a reprint of their split 7", this time on translucent green vinyl. The reprinted 7"s come bundled with a cassingle and are not available on their own. The cassingle is available now while stocks last via Artoffact records. For more information on the bands, please visit their respective official websites HERE and HERE.